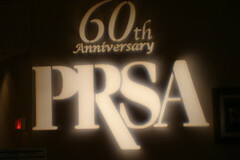 The PRSA has managed to make quite a bit of noise around its crowdsourcing effort aimed at coming up with a new definition of "public relations." As with any such effort, there's always the risk that individuals or groups with zero, limited or even slanted knowledge of public relations will chime in. There will also likely be a number of agenda-driven folks aimed at unfairly smearing PR. Center for Science in the Public Interest (CSPI): "PR makes you really fat." Occupational Safety and Health Administration (OSHA): "PR requires a helmet, handrails, and skid-proof surfaces at all times." Food & Drug Administration (FDA): "This letter concerns PRSA's marketing of the "Public Relations...Defined" communications and marketing initiative. The Food and Drug Administration (FDA) reviewed the label and labeling, including statements made on your website at the Internet addresses www.prsa.org and prsay.prsa.org. Based on claims made by PRSA for this product, PR is a drug under section 245(k)(7)(N) of the Federal Food, Drug and Cosmetic Act (“FD&C Act”), [78 U.S.C. § 654 (k)(7)(N)], as it is intended for use in the influencing of public perceptions. As discussed below, this product is unapproved and your marketing of it violates the FD&C Act..."
Federal Communications Commission (FCC): "As we are now re-classifying 'public relations' under Title II of the Telecommunications Act, PR is now defined as under the jurisdiction of this regulatory body." Office of the Surgeon General: "If you PR with someone, you PR with everyone that person has PR'ed with..."
Coast to Coast AM: "The U.S. military used PR to cover up the Roswell landing and make us believe that the spacecraft from our extra-terrestrial visitors was a 'weather balloon.'" Paul Krugman: "As I've already said in a previous column, PR is something that was clearly George W. Bush's fault. Wait. What? Nobel committee on Line Two? Again? Wow! I should've thought of this years ago!" Media Research Center/Newsbusters: "PR is something that George Soros maybe uses occasionally, thereby proving without a doubt that PR is a vast and far-reaching conspiracy of the liberal media elite." World Net Daily: "PR is a tactic used by far-left-wing fifth-columnist sleeper cells led by an unholy union between Bill Ayers and the remnants of the Symbionese Liberation Army to lull you into a false sense of security and, before you know it, you'll be taxed at 95%, your home will be taken by eminent domain and razed to build an ACORN office, and your kids will spend 10 hours a day in public school indoctrination sessions wearing Che Guevara t-shirts and watching Hugo Chavez speeches. Just you watch!" University of East Anglia Climate Research Unit: "PR? Science? Meh... Tomato, toe-mah-toe..."
TechCrunch: "PR is something that will never, ever change our minds about the fact that RSS is Dead. Dead! DEAD, I TELL YOU!!1! (Although jumping on PR people is a good way to boost traffic, comments, likes and +1's every so often, FWIW LOL.)" Thomas Friedman: "PR is a strategic communications discipline whereby the hot, flat, crowded world can... Wow!!! China! Is! Just! So! AMAZING!" Media Matters for America: "Ummm... Uhhh... Err... FOX NEWS! BILL O'REILLY!!" Letter to The Economist: "SIR - With regard to public relations..."
Charlie Sheen: "PR is a function of my rockstar ninja adonis-DNA amazingness #winning #tigerblood." Keith Olbermann: *sigh* "I said that PR is..."
pr is...what pr people do...as defined by the late John Reed. School Lunch Program: "PR is classified as a vegetable." Phil - Thanks for this tongue-in-cheek look at the impact that #PRDefined *may* have on various groups and organizations that interact regularly with PR pros. The initiative has been a great success so far, with 927 submissions, and about 16,000 words submitted to the PRDefined website (http://bit.ly/PRDefined). We're moving forward with analyzing all of the data, but your post certainly brings the need for this project into greater light, which we thank you for. And as for my favorite of your examples? "Letter to The Economist: 'SIR - With regard to public relations...'" Because we all know that is exactly what every letter in The Economist is written. This is hilarious. My hope was the request made it to Reddit, skewing the data set with "pwnd" and troll-faces (somehow). Edward Bernays fought for a uniform definition and subsequent licensing his whole life -- bet he didn't see this tactic coming. Nice work!